My sharpening setup: DMT extra-extra-coarse DiaSharp plate in separate holder, then DMT Dia-Flat lapping plate, coarse DiaSharp, Ohishi 1,000 and 10,000 grit waterstones, and leather strop. In back are water spray bottle, 25 and 20 degree sight blocks, and Flexcut Gold strop compound. When I took a class with Roy Underhill at Lie-Nielsen a few weeks ago, one of the things we did was pare the corners off a maple bench hook. 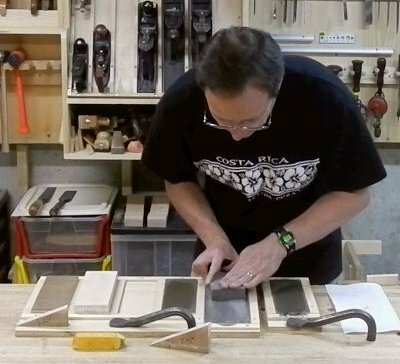 I was having trouble getting my paring chisel to work well, so I asked Roy's advice. He looked at it and suggested I resharpen it closer to 20 or 25 degrees, a more appropriate range for the very fine work of a paring chisel; it was at 30. So I used the sharpening setup in the classroom, which consisted of Ohishi 1,000 and 10,000 grit waterstones, along with a extra-coarse DMT DiaSharp plate, and an extra-extra-coarse Dia-Flat lapping plate for flattening the waterstones. The Ohishi's are a new line that LN has just started to carry; they're not yet listed on the LN website, but you can order them by phone. I did a rough reshaping of the primary bevel to about 20 degrees on the DiaSharp, then added the secondary bevel at about 22 degrees and honed it on the Ohishi's. I was amazed at the polish left by the 10,000 stone, similar to what I get off a strop. I also liked the fact that they didn't need presoaking, just spray the surface with water. The chisel performed beautifully at this new angle. I realized that I was going to have to resharpen all my paring chisels. This seemed like a good opportunity to revisit waterstones. I bought a pair of the Ohishi's and a Dia-Flat from the Lie-Nielsen showroom downstairs. Previously I've shown somewhat unconventional methods for sharpening: convex bevel and a convex double-bevel hybrid, both on oilstones, and a single-bevel on DMT DuoSharp plates. Here I used a more conventional double-bevel on the Ohishi waterstones. 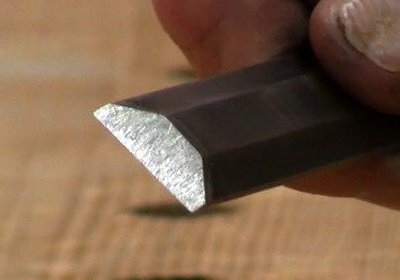 Since I'm reshaping a paring chisel to a lower bevel angle, I also show re-grinding it on a DMT extra-extra coarse Dia-Sharp plate. 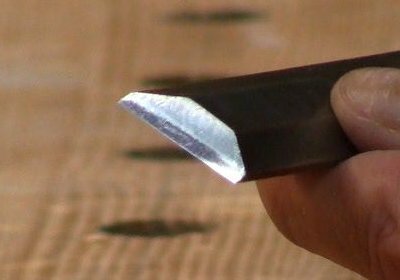 In his book Sharpening, The Complete Guide, the late Jim Kingshott explained that the reason for using a double bevel is that removing a large amount of metal by hand on a single bevel is time-consuming. Grinding a primary bevel on a grindstone reduces the amount of metal to be worked, leaving only a small strip to be honed for the secondary bevel, forming the actual cutting edge. The centuries-old traditional grinding tool was the hand or pedal-powered grindstone, followed later by the powered grinder. 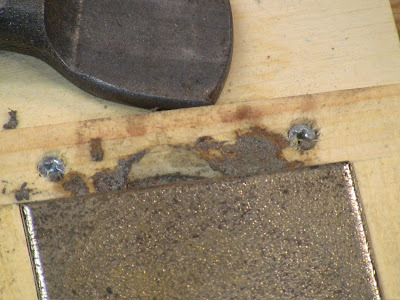 Modern abrasives such as coarse diamond plates, while not as fast as grindstones, offer a reasonable alternative, although opinions vary on whether they are durable enough for extended use this way. Because I want to develop the hand skill to do this entirely hand, I'm not using a sharpening guide. I still haven't gotten the control down for a perfectly flat face, but I expect that to come with practice. I've also worked with deliberately convex bevels enough to know that I can do my woodworking with them, though again opinions vary on that topic. Wildly. If you feel the need to have flatter bevels than I get here, you can do this with a sharpening guide. 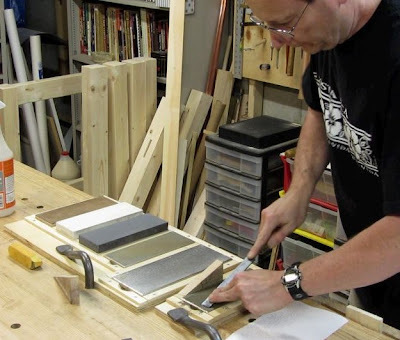 Just realize that you may never develop the skill to do it unaided if you rely on a jig. Kingshott said that when he was an apprentice, it took a year before he was able to achieve nearly the same edge as his master. He eventually did switch to using guides, especially when training new apprentices, but said that if you wish to learn to sharpen without them, it is a mistake to ever use one. I ground the primary bevel on the extra-extra-coarse plate, using a 20 degree sight block to show me the angle. This took less than 10 minutes for a 3/4" paring chisel. This is an extremely aggressive plate, similar to coarse sandpaper. I keep it in a separate holder because I use it as my main shaping tool with a variety of sharpening methods. It's important to check the bevel being formed for square. It's easy to get off track, then you have to spend time correcting it. Since the primary bevel is not a functional part of the cutting edge, I'm less concerned about its flatness. Grinding the 20 degree primary bevel on the extra-extra-coarse DiaSharp. The extra-extra-coarse DiaSharp produces heavy swarf. The metal particles on the wooden holder are like glitter. It's worth wearing gloves when handling this, otherwise you can end up with tiny, very fine metal splinters in your fingers. With the main shape established, I cleaned it up on a coarse DiaSharp. This is what I keep with the waterstones for maintaining shape. Then I switched to the 25 degree sight block and ground the secondary bevel. With the bulk of the metal removed previously, this goes very quickly. Now I'm putting more care into the flatness. I flattened the waterstones on the Dia-Flat plate. This is the same extra-extra-coarse grit as my heavy DiaSharp, but manufactured to a finer flatness tolerance. NASA could bounce laser beams off Mars with one. It also uses a new bonding process that DMT says is more durable. You can read Chris Schwarz' review of the Dia-Flat here. Deneb Puchalski at LN told me to flatten the 1,000 grit first, then use that slurry to flatten the 10,000. Don't do it the opposite order, because the 10,000 slurry will clog the pores of the 1,000 stone. Flattening the 1,000 grit waterstone on the Dia-Flat. I refined the edge on the waterstones. I slowed down the motion, both to maintain better angle control, and to avoid gouging the stones. Especially on the 10,000 stone, the surface tension holds the blade so tight to the stone that the slightest little twitch while moving forward will gouge it. So there I switched to just drawing the chisel back down the stone. 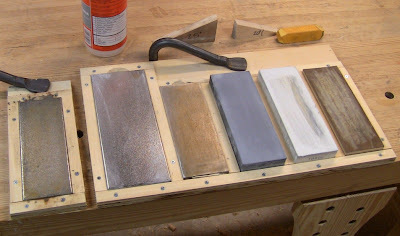 Over several sharpening cycles, I experimented with several honing patterns and grips on the chisel, including holding it right near the edge and using a circular motion, and side to side up and down the stone. I didn't notice a significant difference between any of them, but it's worth trying different ones to see which works best for you. It's also worth revisiting them as your skill improves. The near-mirror bevel off the 10,000 waterstone. This resulted in a near-mirror polish on the secondary bevel. I tried the paper-cut test. FAIL! In repeated tests, I was not able to get to paper-slicing sharp. A quick stropping always rectified that, but you'll see in part 2 how to correct this initial failure. The problem is me, not the stones. For the pine end-grain test, I realized that previously I had been using spruce, a tenon cheek scrap from a 2x4. While soft, this is still a little harder than white pine. So I show both in the video. The theory here is that white pine is so soft that the fibers will crush and tear rather than slice cleanly if the edge isn't sharp enough. 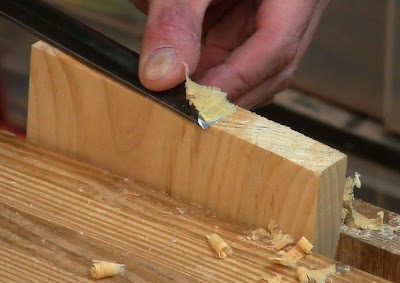 The chisel took thin, clean shavings from both, leaving a smooth surface. Fine shavings on white pine end grain. The Ohishi waterstones did a very nice job, and while just as messy as other waterstones, are more convenient since you don't have to pre-soak them. A note on bevel maintenance: this primary grinding will last for a number of secondary honings. Eventually the secondary bevel will grow to be a significant portion of the face, so I'll regrind the primary bevel. However, I won't take it all the way to the edge. Why spend the time and metal to ruin a perfectly good secondary bevel edge? I'll take it down near the edge so that further honings will start to work their way back up. In this way the two bevels chase each other up and down the end of the chisel over its lifetime, never going all the way, always preserving some of the other. In addition to time efficiency, that maximizes the life of the chisel. The old adage is, "Grind Low,Hone high." The Seaton chest contained two identical sets of chisels, one had about an 18 degree bevel for paring only, I assume, and the other had bevels of around 25 degrees that could be used with a light mallet.